Casino Euro – The European Tour | Madeira! Win one of 20 exclusive holidays and tons of bonus cash! Join the European Tour at Casino Euro for 10 stops, 10 unique European experiences and 10 chances to win a trip. They’ve turned some of the favorite Play’n GO slots into a jackpot slots, where any spin can be the winner. Simply play on the selected games and wait for the goodies to drop. Prizes can drop randomly on any spin and any available ones will be shown in the game screen. Plus everyone wagering on the games will be rewarded with Free Spins on Book of Dead. Start this week with two New Year’s Eve trips to Madeira and 10 bonus prizes. 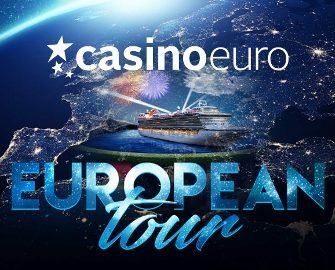 Get ready for 10 weeks of awesome at Casino Euro as they will be giving away two city trips to then European destinations and €50,000 in bonus money in a random cash drop race. Selected Play’n GO slots have been turned into jackpot slots where a prize can drop on any spin. An in-game tab displays remaining prizes and time for the current weekly race. Players can win more than one prize. No OPT-IN is required as anyone spinning on the qualifying games can win prizes. Eligible games for 1st to 7th October 2018: Book of Dead, Legacy of Egypt, Rise of Olympus, Reactoonz and Moon Princess. Every week of the campaign, Casino Euro will give away two city trips to a selected destination. Among the locations are Venice, Amsterdam, London and Heidelberg. There is no cash alternative to the physical prizes. The prize will have to be accepted and confirmed by the winner within 72 hours. Bonus prizes will be paid within 72 hours after they have dropped and need to be wagered 20x within five days, subject to the Casino Euro bonus terms and conditions. For the first week, there are two trips to Madeira up for grabs to celebrate New Year’s Eve on a cruise ship. Included are private airport return transfers, 4 nights B&B at the Pestana Carlton Madeira Ocean Resort Hotel, New Year’s Celebration with cruise and fireworks, full day Madeira Tour and a traditional Monte Toboggan ride. Additionally, there are 10 bonus prizes of €500 that will drop during the week. Players who wager €30 or more on the campaign games will instantly receive 10 Free Spins on Book of Dead. This can be done once per day during the weekly period. Wagering requirement is 15x FS winnings within five days, subject to the Casino Euro bonus terms and conditions.